The Anio Valley to the east of Rome is rich in archaeological remains.The Roman villa on the east slope of the Colle Rotondo (980 meters above sea level) in the Lucretili Mountains near the hilltown of Licenza is one of the best preserved and most significant sites. Attributed by most scholars since the eighteenth century to the Roman poet Quintus Horatius Flaccus (Horace), this villa dates from the first century B.C. and is located just 30 miles from the center of Rome in a lovely valley near Vicovaro and Hadrian's Villa at Tivoli. Besides the impressive remains on the site, the Licenza villa is of interest because it is one of the few ancient houses whose owner we can hope to identify. This identification is possible because Horace wrote several poems about the place, and the location of the villa corresponds to the geographical indications in the poetry. 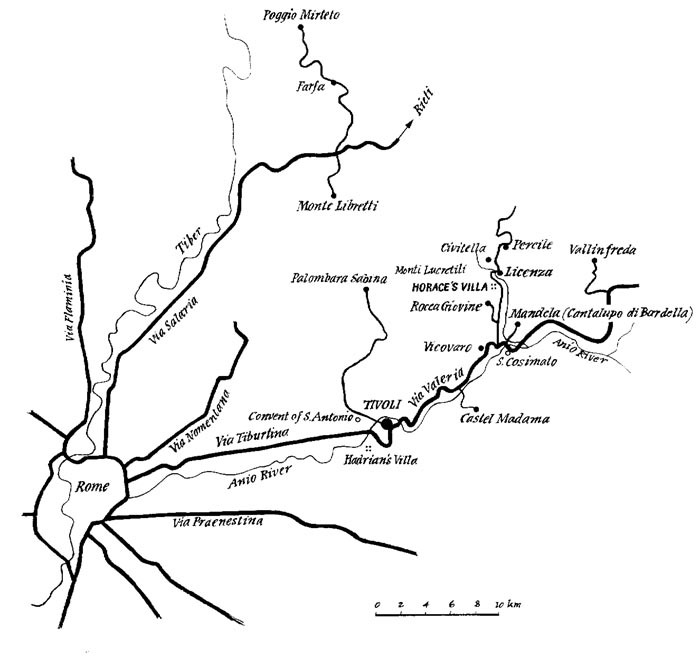 Horace's Villa was situated in the Licenza Valley in the seventeenth century. The actual site was identified and a small portion was excavated in the eighteenth century. Major excavations were undertaken in the early twentieth century. Thus far, the impressive main residence of the estate has been identified, covering, in the imperial period, some 40 x 110 meters of built space and gardens. Black and white mosaics (formerly dated the Horatian period but now known to be Flavian), marble wall revetment and architectonic elements, an elaborate water system, and artistic and utilitarian remains have been found. A selection of the material is on display in the local museum in the town of Licenza. A few of the finds may be viewed here, in our Museum section. This Web site presents the site and the project jointly undertaken there in the period 1997-2001 sponsored by the American Academy in Rome, UCLA, and the Archaeological Superintendency for Lazio of the Italian Ministry of Culture. The project was made possible by the generous support of the Steimetz Family of Los Angeles, the Samuel H. Kress Foundation, the Creative Kids Education Foundation, and the Vincenzo Romagnoli Group. 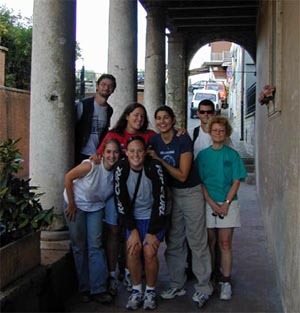 Equally critical to the success of the project was the tireless work of almost one hundred volunteers from twelve countries around the world (some of our 2001 volunteers can be seen in the photo, right). 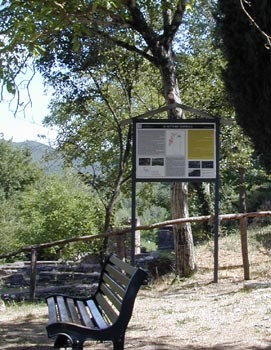 Aimed at lovers of Horace and of Roman archaeology of all ages, you can use this Web site to learn more about Horace's Villa and about our project. The goal of our project was, broadly speaking, to enlarge our knowledge of the site in time and space. Areas adjacent to the part already excavated, including the large central garden, were investigated by electric and magnetic prospection, sondages, and excavation for signs that the main residence was even more extensive than had been previously thought. We also studied the existing architectural remains in the hope of better defining building techniques and periods. We improved the site by shoring up the western slope with a new "green" retaining wall, and we attempted to make visitors feel more welcome by installing benches and signs (see photo, above). The project will be officially completed when we publish a final report giving all the results of our investigations.